MODEL DIMENSIONS: 61 3/4" LOA, 59" LWL, Beam 12", Draft 4"
Presented is a modified version of the original builder's Tank Test model of a research vessel designed and built for Perry Oceanographics in 1975 which was the first of the UNDERSEA HUNTER CLASS. The real vessel was part of a small fleet of ships which carried supplies and submarines for the Navy and NOAA's undersea experiments in the Bahamas and the U.S. Virgin Islands in the 1970's called Hydrolab. Models such as this are very rare in the market place, and are very expensive to build. In order to allow for a more interesting display the original model was cut in half and mounted on a backboard. PROVENANCE: We were able to trace back the model's history to the Stevens Institute of Technology's Davidson Laboratory where it was tested in 1974, and find that this hull is a larger version of the 90 foot "UNDERSEA HUNTER" which was built in 1968. Both this 140 foot ship, and the smaller were designed, and the construction supervised, by Daniel J.W. McCarthy for John H. Perry, Jr. Perry was a newspaper publisher and the founder of Perry Oceanographics, and did much early research in alternative energy sources. Both Mr. McCarthy and Mr. Perry are deceased, and the company is now part of Lockheed Martin. 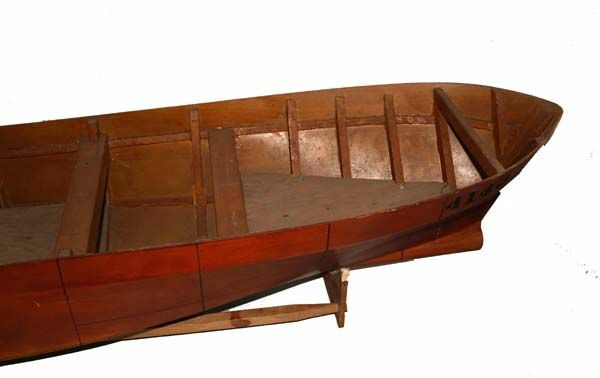 McCarthy had a long career as a draftsman, naval architect and designer of all types of vessels, including those for the U.S. Navy and the famous Garlington sports fisherman's. His career started in 1954 and ended with his death in 2003. This ship was designed as a larger version of Undersea Hunter which carried the submersibles when Perry was doing the testing for the Navy and NOAA in the Bahamas and St. Croix, USVI. Undersea Hunter and her larger sister were used by them as submarine support and research vessels. 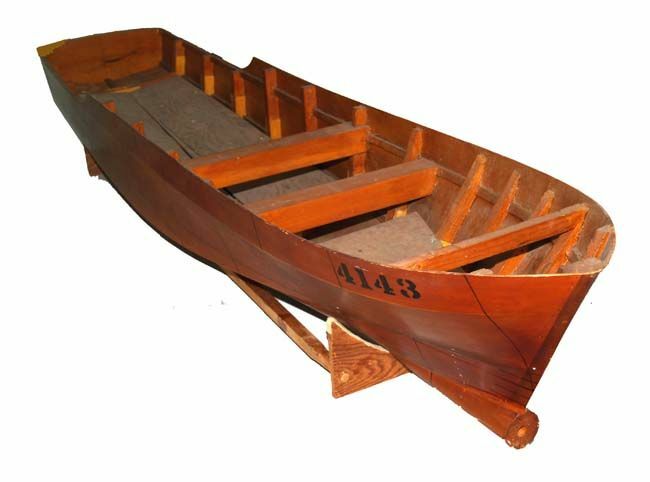 Unnamed Model Hull Number 4143 was tested in 1974. It is a 1/24 scale model of the 140 foot Length Overall, 116 foot, Length Water line, 256.2 Long Ton bulbous bow diesel vessel. Three different bulb locations were tested in calm water up to 16 knots. Additional examinations of dynamic course stability while alongside another vessel were performed. Perry owned vessels supported the NOAA sponsored underwater astronaut/scientist training facility off the Bahamas, known as "Hydro-Lab" which operated there and in the Virgin Islands for 15 years ending around 1985. The Hydro-Lab was recognized for many underwater "firsts", including the dry transfer of men from a Perry built submarine. Perry vessels were also were in support of the Deep Rover Project with Dr. Sylvia Earle. John Perry was on President Johnson's U.S. Commission on Marine Sciences, Engineering and Resources. Because of size, this sale is restricted to U.S. Buyers in the contiguous 48 States only. SHIPPING: The buyer is responsible for making arrangements for packing and shipping using his own forwarding agent and carrier. If the buyer wishes to use the seller's assistance for shipment, he shall hold seller harmless for any damages or loss arising out of their participation. Shipping can be arranged through LDG Delivery Service for the U.S. East Coast, and certain cities in Michigan, and Indiana. Contact L. Drew Gerard, for quotes. 561-212-7159, Email: antiquedelivery at aol dot com This is for delivery only! Buy this very special builder's tank test model Now! What a great find for that special person who can appreciate only the finest and most unusual.